Christoph Willibald (Ritter von) Gluck was born on July 2, 1714 in Erusbach and died on November 11, 1787 in Vienna, Austria. In the Classical Period of music (1750-1825), Gluck is famous for his contribution to Opera, he wrote 45 and reformed the structure of Opera in general, returning to a simpler style. In 1580, a group of intellectuals in Florence called the Camerata envisioned a new form which would incorporate Classical Greek drama, with chorus, staging, dance and music. The first Opera was Euridice (1600) by Jacopo Peri (1561-1633), followed by Euridice (1602) by Giulio Caccini (1546-1618) and, later, by La Favola d’Orfeo (1607) by Claudio Monteverdi (1567-1643); Gluck’s Orpheo ed Euridice (1762) was based on the same plot, but with a happy ending (the god of love restores Euridice’s life) and was the first of his “reform” Operas. 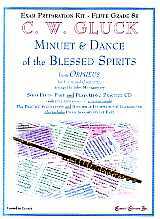 The Minuet and Dance of the Blessed Spirits is from Orphée, a French revision of the opera, which Gluck produced more than a decade later in Paris (1774). The DANCE (3/2 section, bars 37-72) was originally in the meter of 3/4; in this arrangement all of the rhythmic values have been doubled and the meter changed to 3/2 to allow the quarter note to remain the same (i.e., quarter = 80) throughout the entire piece. There are several slightly different tempo suggestions in various arrangements of this work; in addition to Lento, for the MINUET: Andante and Lento dolcissimo (with suggested metronome quarter = 76 to 80); and in addition to Un poco piú Lento, for the DANCE: Lento and piú Lento (with suggested metronome eighth = 80 to 96 in 3/4).